NO DRILLING, GLUING, OR ASSEMBLY REQUIRED!! MADE OF SUPERIOR POLYCARBONATE, NOT ACRYLIC!! MORE LED'S PER RING THAN ANY OTHER RINGS!! Don't be fooled by the other speaker rings out there. Our rings are the choice of OEM's such as MasterCraft Boat Company. All of our rings have a frosted edge to help even out the hot spots from the LED's and make the rings as visible as possible when on. These LED Speaker Rings are designed specifically for the JL Audio M770 and MX770 Speakers. They are the same speakers that have come stock in most MasterCraft boats since 2005. Add a truly custom look to your boat with these LED Speaker rings! Ships fully assembled and ready to install. Connect to any 12 Volt DC power source and your boat will come alive. These rings are only 1/4 thick and virtually disappear when off. The rings are available in Red, White, Blue, Green, and Yellow. Please specify which color you would like. Empire HydroSports Lights are for show purposes only; please check your local and state laws for the proper use of this product. Empire HydroSports assumes no liability for the installation of the product. 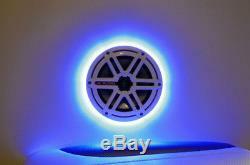 The item "JL Audio Marine M770 MX770 LED Speaker Rings Lights Empire Hydro Sports" is in sale since Thursday, June 05, 2014. This item is in the category "Consumer Electronics\Vehicle Electronics & GPS\Marine Audio". The seller is "hagenempire84" and is located in Minneapolis, Minnesota. This item can be shipped worldwide.